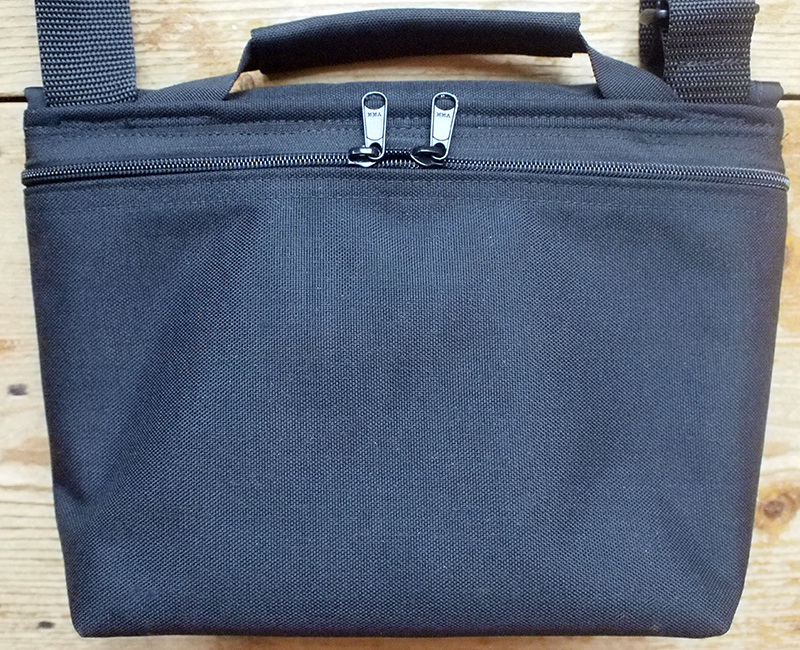 Finally a bag for the active working photographer… the Bare Bones Bag Evolution! Built on decades of shooting experience and a careful look at historic carry solutions, the BBB-E is unlike any “camera bag” made. Each BBB-E is handmade in Vermont to Stephen Schaub’s exact specifications. The BBB-E is made out of top quality materials and is designed to last a lifetime! This is a professional camera bag designed for the most demanding professional photographer. UPDATE 2.1.2012 – The BBBE is now available with three different color flaps choices – pick what fits you best! Two deep front pockets with high quality nylon YKK zippers for added security. The pockets are perfect for an iPhone, media wallet, a few rolls of film or a Moleskine journal. 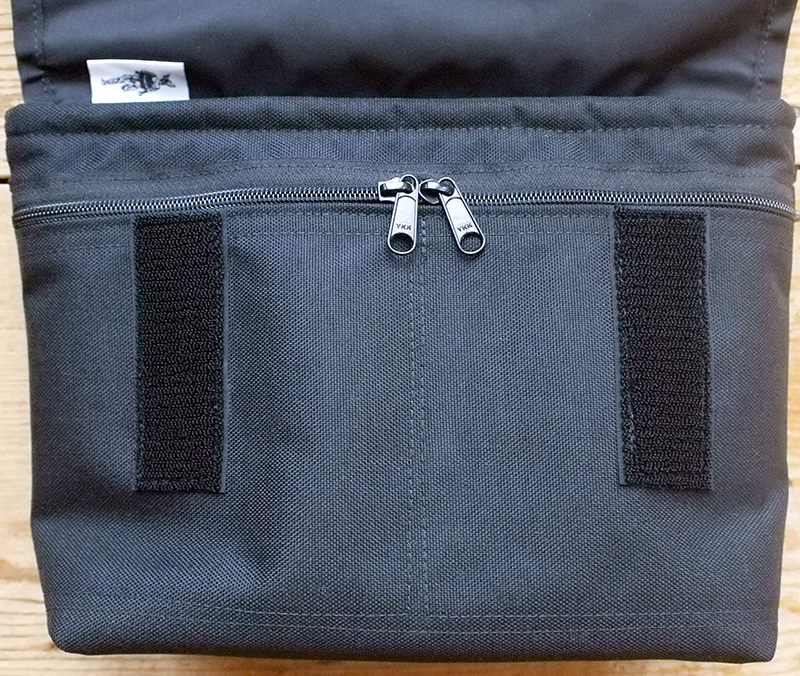 The zippers won’t scratch gear and help keep everything neat and organized. One deep back pocket with high quality nylon YKK zippers for added security. This pocket has been sized to perfectly fit an iPad 2!!!! 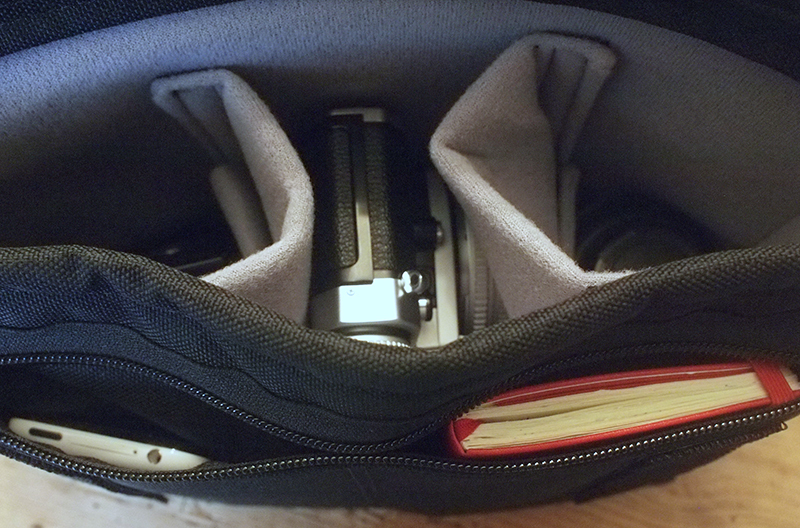 Interior is a high quality “padded” compartment that is adjustable to fit many different camera systems. The padded areas of the BBB-E are truly the “Goldilocks” of padding… juuuuuust right. This bag is not your normal stiff heavy padded camera bag… it moves with you for the perfect all-day carry. Two soft, vertical interior dividers, as well as 2 half “shelf” dividers are included with each bag. Two vertical interior dividers have velcro on 3 sides for a more secure attachment. Body of the BBB-E: Durable Cordura nylon outer (1000 denier). The bottom of the BBB-E is durable cordura nylon (1000 denier)… two layers thick! All bag stitching is done with non-wicking sail-cloth thread. Inside of the BBB-E: The soft, high-quality GREY Velcro fabric liner is sewn in separately, creating a bag inside of a bag for maximum protection and water-proofing. Two Velcro closures on the flap: fast open, secure close with a minimum amount of velcro noise. Shoulder straps are 1.5 inches wide. 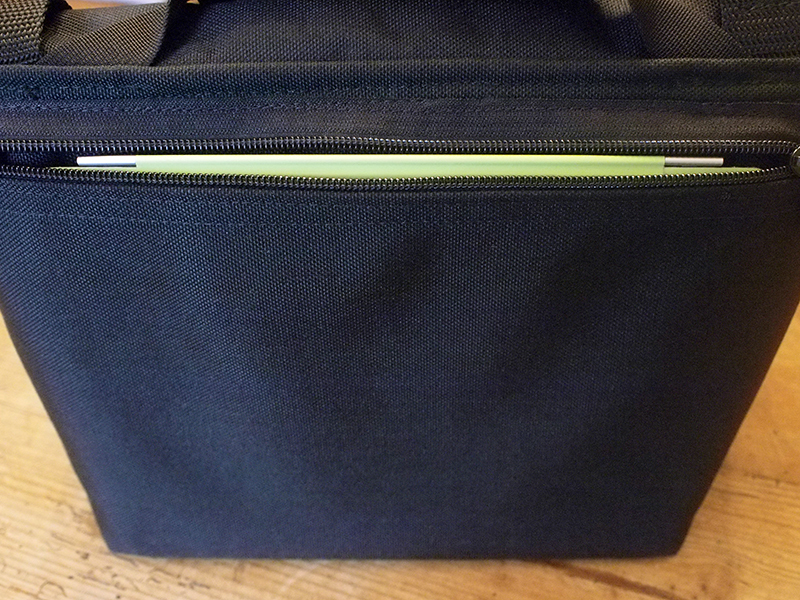 The attachment sandwiches into the top seam of the bag for added security and a fantastic carry. 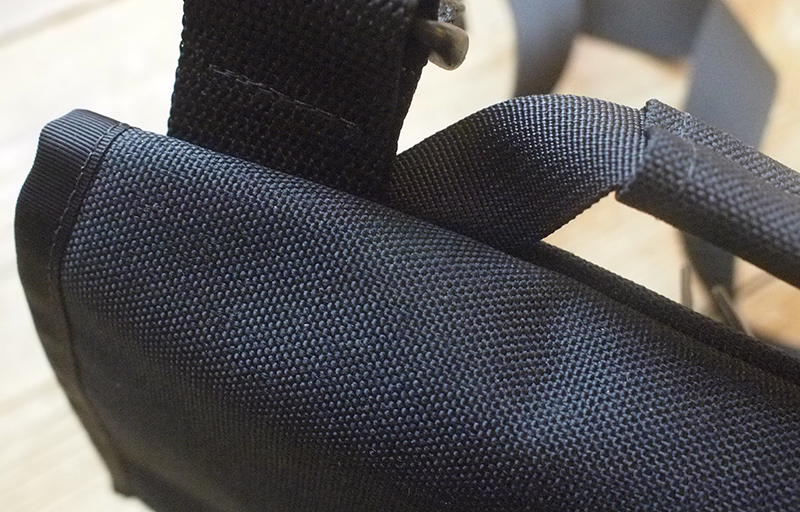 This strap design also works to keep the bag tightly closed when worn. Also included is a black shoulder pad which is perfect for that extra heavy load. 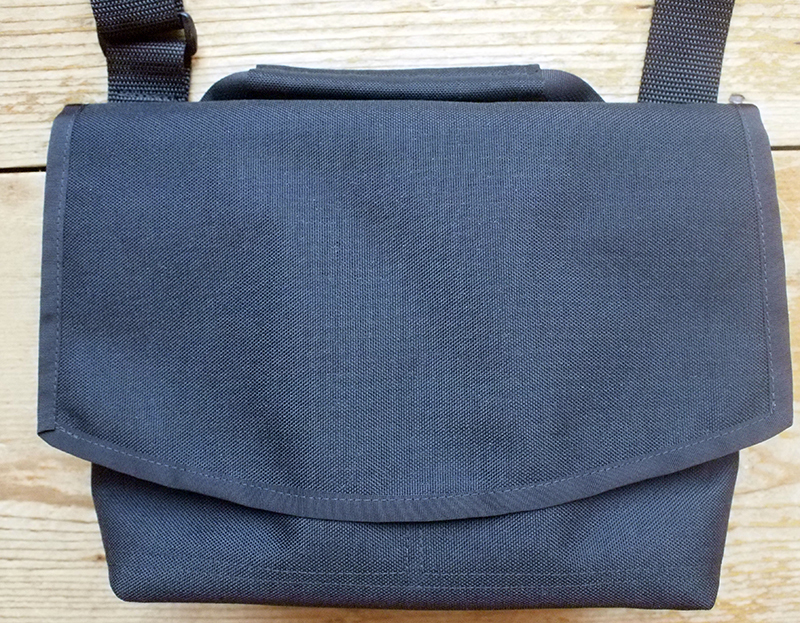 1/4″ Neoprene pad in the base of the bag which is removable through the back zippered pocket. NO exterior logo or name of any kind. Black exterior with Grey interior. UPDATE 2.01.2012 – NOW AVAILABLE IN 3 DIFFERENT FRONT FLAP COLORS! Made in the USA (Vermont) using only the finest materials!!!! The Bare Bones Bag EVOLUTION (BBB-E) is just $165.00 US Plus Shipping and Handling (USPS). Great conversation by BBB users can be found here on Rangefinder Forum. Leica M System with multiple lenses or two bodies with lenses attached with room for extras. Nikon FM2 or FM3a with multiple lenses or accessories. Micro 4/3 systems by Olympus and Panasonic with multiple lenses… this includes the EP2 which I carry with the EVF attached. Sony NEX systems including the new NEX 7 which is perfect for the BBB-E! Fuji X100 and X10 Kit with lots of accessories. LOMO LCA Kit with lots of accessories. LOMO HORIZON with film and meter and accessories. Zero Images Pinhole camera (120 version 6×6) with meter and film and extras. Cuboid Pinhole Camera with meter and film, iPhone and extras. Zeiss Ikon system… body and multiple lenses. Hasselblad 903 SWC with extra back and meter. Nikon J1 and V1 System. 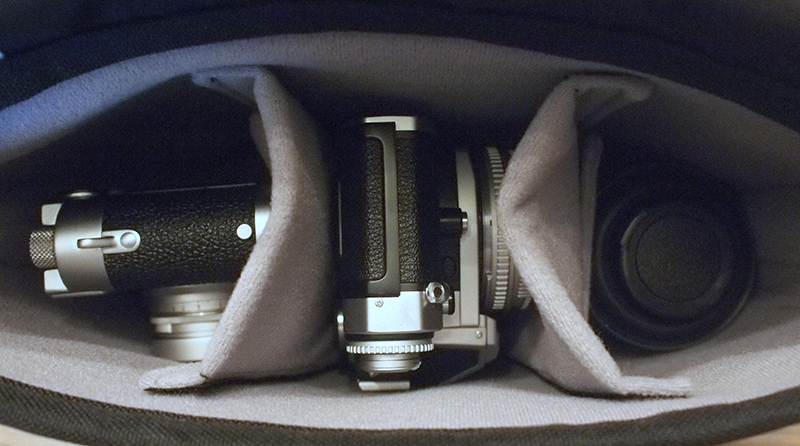 You get the point… the BBB-E is a real shooter’s bag! All stitching and workmanship are included in the warranty. A sales slip is not required. There is a nominal charge for repairs that are not covered under the warranty (for example, your dog chews a hole in it) at your expense. Return Policy: Due to the custom nature of this product, NO RETURN IS POSSIBLE ON THIS ITEM. Question: How long will it take to get my BBB-E? Answer: Most orders ship within 2- 3 weeks. You will get an email from Courierware when your order ships. Question: Can you describe the ordering process? Answer: Once received, you will get an e-mail confirmation. Next, you will receive another e-mail stating that your order is “complete”- which means it is now at Courierware being made. two-three weeks later you will receive an e-mail from Courierware stating that your bag has finished and shipped. Question: What is the method of shipping? Answer: United States Postal Service… We suggest Priority Mail on all orders including International. Question: What colors does the BBB-E come in? Answer: Black exterior, Grey interior…does not scream “camera bag”! UPDATE 2.01.2012 – NOW AVAILABLE IN 3 DIFFERENT FRONT FLAP COLORS! Question: What about additional weather proofing? Answer: The BBB-E is extremely weather resistant!!! The outer shell is Durable Cordura nylon (1000 denier) which is sewn using non-wicking sail cloth thread to the inner bag. I have been in rain for several hours with this bag and never a drop has touched my gear! Question: What is the quality control like? Answer: The BBB-E is hand-made here in Vermont by Courierware…a premier Messenger Bag maker with over 20 years experience. Courierware was recently rated best overall messenger bag by the Wall Street Journal. I have worked with Courierware since 2006 without fail…they first made my Response Bag (discontinued) and now of course the BBB-E. Quality at Courierware is first and foremost! Nuf said. Question: What is the weight and size of the BBB-E? Answer: The BBB-E empty weighs in at 16oz with the shoulder pad and a mere 14.25 oz without the shoulder pad. The size is approx 9″ x 10″ x 4″ external and 8.5″ x9.5″ x 3.75″ internal. Question: How much gear can I stuff into the BBB-E? Answer: More than you would ever want to for an all day carry but for the best results do not over-fill the bag. Question: Will my Nikon or Canon Lenses fit in the BBB-E? Answer: See sample images above for an outline of what will fit the BBB-E. A big Nikon DSLR or Canon DSLR will not fit the BBB-E.
Answer: To wash your bag put it into a regular washing machine on COLD. Use a small amount of soap. The liner and the outer shell of the bag are sewn together only around the top of the bag. For better washing and faster drying you can separate the two layers by pulling the liner out from the inside of the bag. Spot wash any particularly bad areas before throwing it into the machine. After washing, let any trapped water settle to the bottom and squeeze it out of the lowest corner. LINE DRY – DO NOT USE A DRYER. Heat can melt the waterproofing. The Velcro divides should be removed before washing and washed by hand. Final Note: The BBB-E has been tested by me and other working photographers before being released. Crescent Valley LLC however cannot be held liable for any damage in whatever form from the use of the Bare Bones Bag EVOLUTION : BBB-E.